Until the founding of Penn’s Medical School in 1765, training for aspiring American physicians had been limited to apprenticeship with doctors here or formal education at medical schools in Europe, particularly in Edinburgh. The two-year medical curriculum developed by the new Penn medical school was based on the core curriculum of anatomy, materia medica, botany, chemistry, and the theory and practice of medicine plus courses in physics, anatomy, midwifery, and surgical theory. Learning was done through lecture and textbooks; there was no provision for hands-on learning in the form of laboratories, practicums, or internships. Apprenticeship opportunities were separate from the courses offered in the Medical School. For the next century and longer, the content, teaching, and duration of Penn’s medical curriculum would undergo many changes as new medical discoveries were made and as different views of the nature of medical education became popular. The continued acceptance of the apprenticeship complicated the development of medical education in a university context, as the medical profession struggled to work out such issues as the relative merits of apprenticeship vs. academic education and of clinical vs. theoretical teaching. The situation was complicated by competition between medical schools. Individual medical schools hesitated to lengthen the course of medical study and to otherwise raise their standards out of fear that they would lose students (and income) to other institutions. In fact, in 1847, when Penn’s Medical School increased the annual course of study from four months to five and a half months, student enrollment declined and the reform was quickly abandoned. Thus, admission standards at Penn and elsewhere were almost nonexistent, and once enrolled, students were required to take only two years of lecture courses, with little opportunity for dissection or other hands-on learning. To learn medical specialties, students had to arrange and pay for private teaching outside the medical school curriculum. Thesis requirements were often waived, and medical degrees could be granted after only a superficial oral examination. Thus, for much of the first half of the nineteenth century, American medical education was in a state of disarray, with most efforts at reform and standardization meeting only limited success. Significant changes during the decades after the Civil War would establish the framework of modern medical education. At the start of the Civil War, Penn medical students were taking courses in the theory and practice of medicine, institutes of medicine, theory and practice of medicine, anatomy, chemistry, surgery, and midwifery, but still received their medical degrees after just two years of study and with little opportunity to practice what they learned. All this would change significantly in the two decades after the war. The experience of doctors during the Civil War led to a new emphasis on the training of doctors in surgery and also on the learning of anatomy through dissection. Before the Civil War, the scarcity of cadavers had meant that medical students studied anatomy mainly through textbooks and models, and rarely with actual human bodies. This changed when Dr. William S. Forbes, a teacher of anatomy in Philadelphia who had served in the war, successfully led the drive to convince the Pennsylvania legislature to pass a bill requiring the delivery of those bodies to be buried at public expense to physicians and surgeons for study in public and private medical schools. During the 1860s, 1870s, and 1880s, there was also a broadening of the medical curriculum to incorporate new scientific and medical discoveries. Lister’s discoveries prompted the introduction of the study of hygiene as well as of morbid anatomy; the evolution of more specialized knowledge in other areas led to the addition of specific courses on the diseases of women and children, microscopic anatomy and pathology, and diseases of the mouth, eye, ear and skin. The University’s 1872 move from its Ninth Street campus to its new site in West Philadelphia presented the opportunity for Penn’s medical school to move forward in all of these areas. 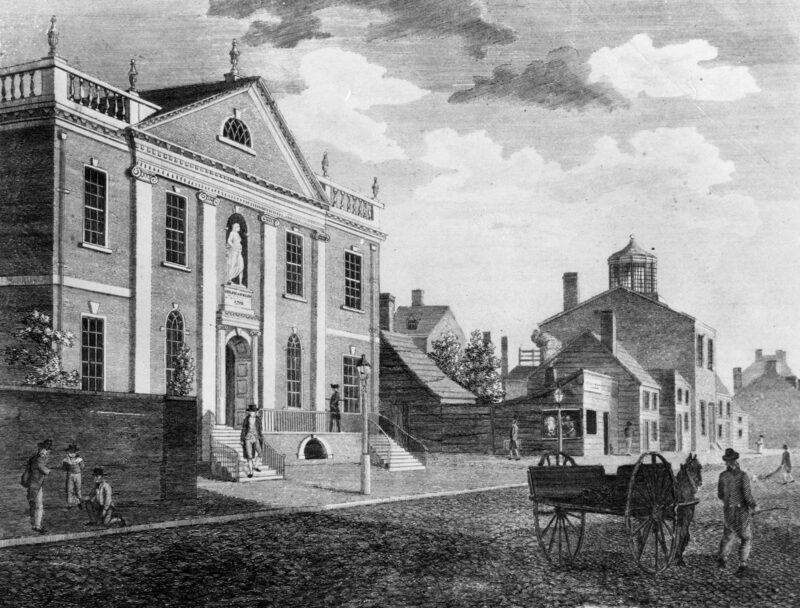 Not only did the school gain improved facilities in its new medical hall (now Logan Hall), it also gained the Hospital of the University of Pennsylvania. 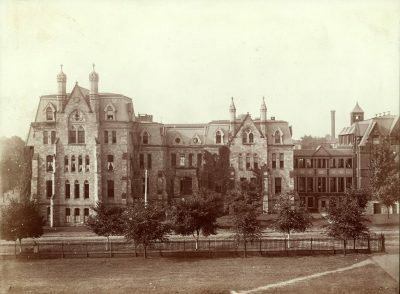 The construction of this hospital in 1874 made Penn the first American medical school to build its own teaching hospital staffed by its own faculty. This new hospital, the recent increase in the availability of cadavers for dissection, plus the addition of laboratories and practicums to the curriculum insured that Penn medical students would henceforth be more experienced graduates than their predecessors. In 1876 the course of study for a Penn medical degree was finally increased from two to three years to accommodate all the added courses and experience now available for medical students (the requirement of four years of study to receive the M.D. degree would become effective for students entering in the fall of 1893). Not until the fall of 1880 would there be any set of standards for admission to Penn’s Medical School, involving only a one-page essay and a written examination in elementary physics. The 1889 entrance requirements would be somewhat stricter, but still it would not be necessary to have a college degree, or technically speaking, even a high school degree. Comparison of the curriculum for Penn’s Medical Class of 1889 to that of students before the Civil War shows that by the 1880s students not only studied on a different campus, they also stayed in medical school an extra year to accommodate the addition of new fields of study and of hands-on experience into the curriculum. Surgery and hygiene, as well as specialized areas of medicine, were now seen as necessary parts of medical education. And before being granted a medical degree, students were now expected to dissect actual human bodies, to have practice in everything from bandaging to surgery in laboratories, practicums and even supervised experience in operating rooms and on the floor.